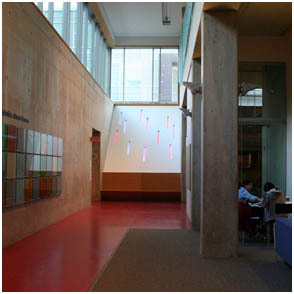 Embedded in a light-well at the end of a long hallway, the piece adds colour to a busy area of campus. Inset into an angled wall at the end of a long corridor are eleven tall channels, glowing with light from within. As people ascend and descend the staircase opposite the piece, their movements are reflected in rippling white light that flows up and down through the channels. The channels are arranged geographically to represent eleven worldwide market indices, from New York to Mumbai to Hong Kong. The colours of the glowing channels are determined by the fluctuations of real-time financial data. Up/Down was designed to engage the Schulich community at three levels - it offers visual interest in what was a static space; it delivers a delightful interactive experience that represents the individual's impact on the global markets; and it is an ongoing ambient information source for an internationally focused audience. More images of Up/Down here.